Modulus powers the most successful exchanges. If an exchange isn't fast, it's slow. Designing an exchange capable of processing ten million transactions per second wasn't an easy task, to be honest. It took us nearly two decades to reach this level of performance. You can think of it as a barrier to entry... for your competition. The world's fastest, most secure, and most successful exchanges are powered by Modulus. Most exchange solutions are not only slow and lack basic security features, they limit trading capacity and profitability. They come with costly revenue sharing schemes and long-term contracts designed to lock clients in for several years. They're also hard to get up and running, and even harder to scale. The Modulus exchange solution is different. We designed it to empower you, not raid your profits. Our white-label exchange solution for cryptocurrencies, security tokens, equities, FX, and derivatives trading allows you to operate your exchange entirely on your terms. For a one-time license fee, we'll install our solution on your AWS or Azure servers, or on your own hardware, provide training to get you started, and hand the controls over to you. Should you require any assistance from us, 24/7 support is just a phone call away. There are no imposed limits. Our exchange solution is versatile. You can list unlimited tradable assets, including digital assets and fiat currencies (if your business is licensed to deal in fiat currencies). You can trade cryptocurrencies, forex, equities, precious metals and commodities, futures, bonds, and other assets. The user interface, and even the matching engine, can be customized, if required. In fact, every part of our solution can be customized to any extent. With Modulus, there are no long-term contracts, recurring license fees, or revenue sharing schemes. Hundreds, and even thousands, of coins and tokens can be enabled; however, as the exchange operator, it is your responsibility to determine the legality surrounding each listing. We've been building exchanges for 20 years. High performance technology for financial markets has been our focus for over two decades. We provide only the best solutions, and our offerings are not cheap. Low price is the last refuge of software companies that lack the necessary resources and qualifications to deliver quality solutions capable of withstanding heavy load and strict government regulation. With Modulus, you will have complete peace of mind, so you can focus on your core business. Our exchange shatters performance barriers. Our solution was designed to disrupt the industry and to provide our clients with a competitive advantage. Many exchanges can't handle more than one or two million transactions per second. Some can't handle 100,000 or even 15,000 transactions per second. Our exchange easily outperforms them all, by leveraging our two decades of experience and source code frameworks. Additionally, our source code has been written in the Go programming language, which was designed by Google in 2009 as an alternative to standard programming languages like C++. Go was designed for computationally intense server applications. Our licensing model is fair and honest. Most vendors require a long-term contract and many will impose a revenue sharing scheme. Some vendors offer liquidity "solutions" designed to steal your profits. And almost all vendors charge extra for optional features or for adding coins or tokens. At Modulus, we charge a simple one-time license fee, which is straightforward, fair, and honest. We will never create software limitations or problems for you in order to extract additional profits. 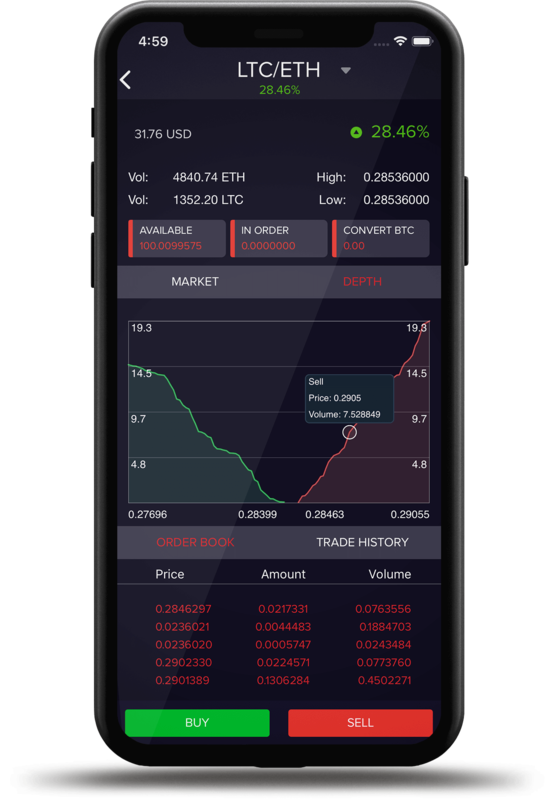 Includes a pre-built, customizable exchange website, a React web app, and React Native mobile app with a modern appearance, designed for iPhone SE (4" screen), iPhone 8 (4.7" screen), iPhone 10, Android phones, tablets, desktop, and web. Our UI design solves shortcomings and UX design flaws of existing popular exchange apps. The UI supports multiple languages via a globalization file, including right-to-left text. Features include 2FA, full GDPR compliance, professional charting, technical analysis tools, a chat room, news and announcements feed, asset knowledge base, push notifications and more. Admins can issue new listings, if permitted by law in your jurisdiction. Set your own deposit and withdrawal limits for one user or for all. Offer margin trading and lending. Fractional share trading. Set up trading halts and curbs based on specific criteria to prevent flash crashes. Run Proof of Solvency audit reports to prove reserves. Permit institutional traders to connect via FIX protocol, or enable Dark Pool trading. Maintain an affiliate system to reward traders for referrals, offer auto-trading, expert advisors, market scanning, trade alerts, trading system back-testing, social media integration, social media sentiment analysis, pattern recognition, A.I., chat room, and more. List new assets (coins and tokens for cryptocurrency exchanges), follow live stats within graphs and gauges for number of new user signups per hour, number of trades per day and per hour, average trade size, detailed order book information, exchange security status, and review other important information including Profit & Loss, Open Positions, and Account Balances, manage liquidity, manage individual or group user accounts and much more. We'll help you overcome obstacles to growth-at no extra cost. Most new exchanges fail to gain traction due to inadequate trading volume. It's a common dilemma: a new exchange needs to attract customers, but customers need sufficient trading liquidity to place trades. If there aren't enough customers on the other side of the equation, nothing happens. The exchange goes nowhere. That's not an issue, if you are using Modulus. Your exchange can be connected to other exchanges for added liquidity, and you can adjust rebates and cash incentives to attract market makers to your exchange. At Modulus, we do not charge additional fees or require revenue sharing for adding liquidity to your exchange, unlike other providers. You can also offer rebates and cash incentives to traders to facilitate market making. With Modulus, the choice is yours. Just remember: your local laws and regulations may stipulate what you can or cannot do with regard to market making, so be sure to consult with your legal counsel before launching or enabling certain features. This isn't only the fastest, most powerful exchange solution out there. It's also one of the most secure. As financial technology experts, we've taken every possible risk and vulnerability into account. We've learned from numerous sophisticated attack vectors that we've witnessed over the past 20 years. Your exchange will be protected with multiple security layers including two-factor authentication, anti-phishing features, geofencing that also detects VPNs and Tor exit nodes, database encryption, DDoS mitigation, network and trade anomaly detection, enterprise-grade offline multisignature vaults (for cryptocurrency exchanges), optional hardware security devices, plus independent penetration testing and source code analysis. Use Know Your Customer (KYC) verification to process identify checks (name, address, and ID documents), and Anti-Money Laundering (AML) to monitor real-time risk scoring through machine learning. We support KYC & AML providers such as Jumo, Trulioo, IdentityMind, Shufti Pro, SynapseFi, Cognito, and 4Stop. Our exchange solution has been designed to comply with current and future regulations. Using machine learning, the Modulus exchange solution analyzes pre-trade and post-trade data to identify suspicious activity such as large trades, pass-through trades, wash trades, spoofing, layering, stuffing, hammering, momentum ignition, and money laundering, allowing administrators to freeze accounts as needed and generate Suspicious Activity Reports for regulators. Please note that the Modulus exchange solution may not be used for converting cryptocurrency into real currency or vice versa without proper licensing and regulatory oversight. The solution may also not be used for sports betting or gambling if not permitted in the jurisdictions where you plan to conduct business. Modulus provides geo-fencing functionality to prevent unauthorized users from accessing your exchange, if required. Consult with a lawyer before launching your exchange. Cryptocurrency exchanges must follow all rules with proper legal compliance, AML, and KYC in place for not only the jurisdiction in which the exchange is domiciled, but also for each jurisdiction in which it conducts business. Modulus provides software that sits between financial products and institutions. As such, we are not a licensed financial institution. If your organization plans to accept deposits and issue credits on any crypto currency network, it is likely you will need to be a licensed money services provider (MSP) or mobile money operator (MMO). All Modulus clients should heed the regulatory environment of their organization. Modulus does not provide legal advice or guidance.